I would consider Dave and myself fairly NON-picky eaters. Of course, we both have our favorite foods, but we will try almost anything… and we like almost everything we try. That said, neither one of us will eat pickles — any type of pickles. We don’t like the taste, we don’t like the smell, we just don’t like pickles. 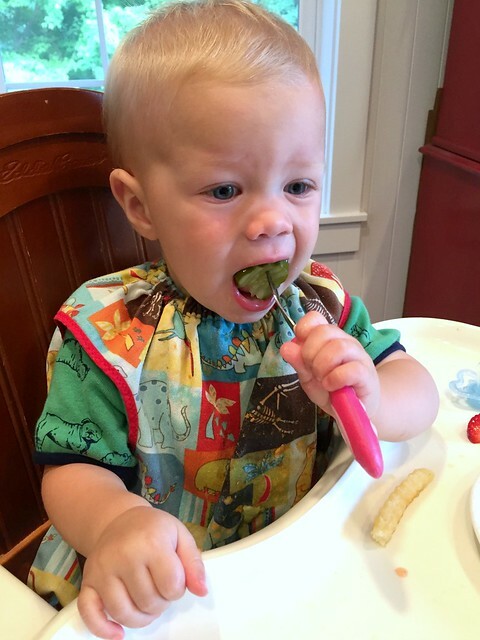 Ironically, dill pickles were one of the very first foods Nora ever ate (at almost 2 years old)! She would eat strawberry yogurt, instant mashed potatoes, and pickles… that’s it! So of course, I fed her pickles! Since then, all 3 of our older kids have been obsessed with dill pickles — they will eat them with almost any meal I allow, and Nora frequently requests them as “dessert”. Crazy girl! 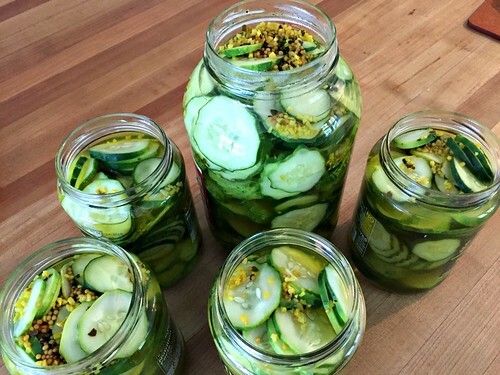 A few years ago, once I realized how many pickles we went through every year, I decided to try pickling my own garden-grown cucumbers… and to my surprise, the process was SOOOOOOOOOO simple! The one super nice thing about refrigerator pickles is that you don’t need any traditional canning equipment and you can make as big or as small of a batch as you’d like (you could literally just try one jar if you want). I’d like to eventually try canning pickles, but for now, these refrigerator dill pickles are so quick and easy to make, and we can easily eat them all up within the 6-8 month time-frame. 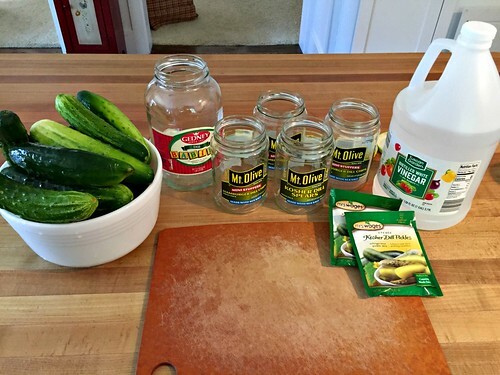 If you’d like to try “canning” your own cucumbers, I doubt you’ll find an easier recipe to start with! **NOTE: I have no affiliation with Mrs. Wages; this is just the only brand our Meijer sells and it’s what I’ve always used with great success! Mix up vinegar, water, and “spice” mixture via the directions on the back of the Mrs. Wages package and bring to a boil. While vinegar mixture boils, thinly slice cucumbers and pack them into clean jars (I run mine through the dishwasher right before so they are still hot). Ladle hot vinegar mixture into jars until cucumbers are covered. Tightly screw lids onto jars. Let cool at room temperature for several hours. Refrigerate and eat within 6-8 months. 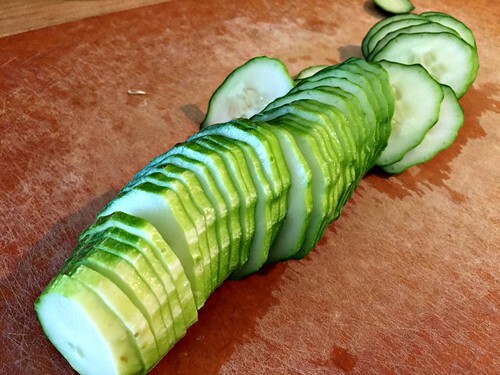 The whole process takes maybe 20 minutes, and most of that time is spent slicing the cucumbers (I just use a knife). I’d love to know… do you love pickles or hate them? As always, visit my virtual recipe box for more simple, delicious, family friendly recipes! My husband and I LOVE pickles, of almost any sort! And not just pickled cucumbers: carrots, green beans, cauliflower! Also cabbage, (raw and cooked), olives of all sorts, and pickled hard boiled eggs too! I am definitely going to find that mix and try it! WOW — I did not know you could pickle all of that! I might have to try pickled cauliflower — I could eat raw cauliflower all day long I love it so much! I want to give these a try. My husband and I love pickles!!! well my kids LOVE these pickles! Hope you do too! My family loves pickles and if I have cucumbers, I like to make this recipe for dills….it’s from a blog called Annie-Eats and it’s worked really well for us. Cut the cucumbers into spears. Add the spears to the jars, packing in as much as you can without forcing. In a large measuring cup, combine water, vinegar and salt. Stir till salt is dissolved. 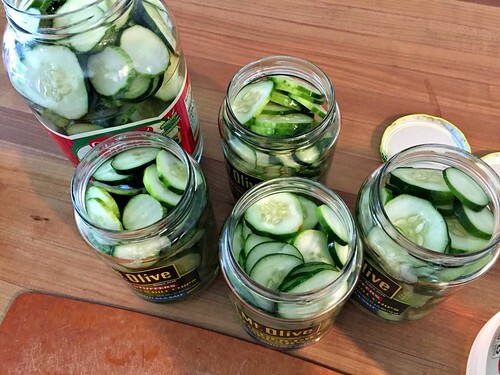 Pour the mixture into each jar until the cucumbers are completely covered. Top with additional dill if you wish. Screw on the lids. If you run out of brine, make more, it’s quick. Thanks for the recipe. I might try growing Dill next year too — that would be a fun project to can with my own cucumbers AND my own dill! 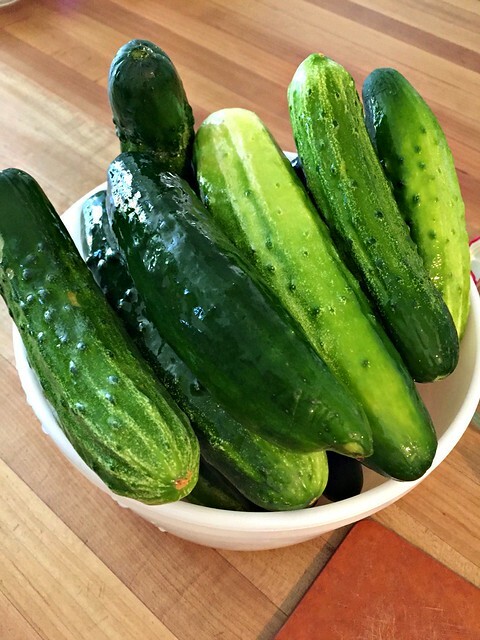 Does it matter what kind of cucumbers you use – pickling v. regular slicing? Thanks! I have a feeling it would work with any type of cucumber — but since my intentions are to pickle them, I always use pickling cucumbers. Wow, I’d never have figured that pickles could be made so fast – but when are they ‘really ready’ to eat and taste like they should? About all the dills we eat at our house are the really crunchy dills that Claussen makes – great for pickle roll-ups appetizers/snacks – get the Dak-type rectangular sandwich ham slices, and blocks of cream cheese (whatever kind you prefer). Let cream cheese soften, then dry of slices of ‘Dak’ ham, spread the cream cheese on the ham, put a whole Claussen dill pickle on one long end and roll up. Make a bunch of these and put in fridge to meld flavors. When take out to eat, cut the ‘roll’ into slices and put out some Ritz crackers to eat them on (if you pre-prepare them together, the Ritz will get soggy-ish!). 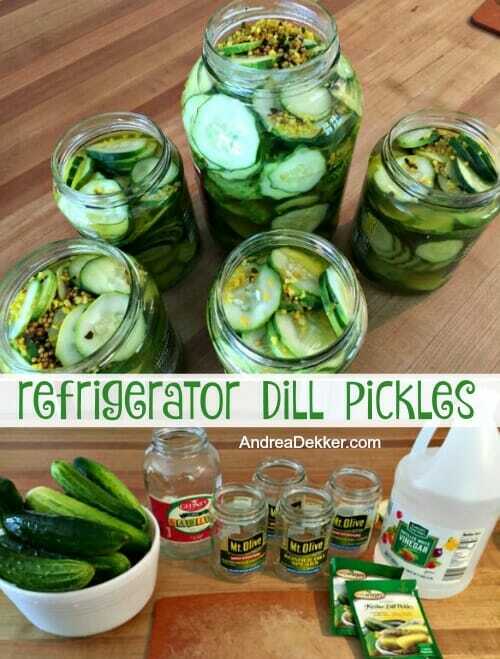 We’re not big pickle eaters either, but love dills this way! 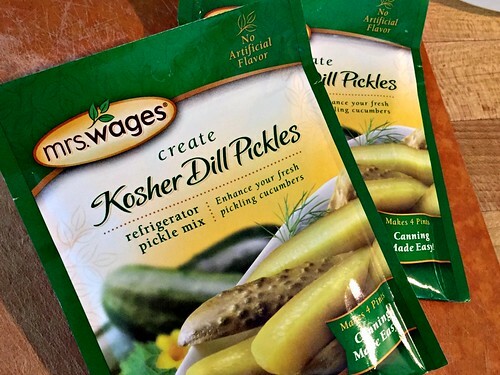 By the way, I do like bread & butter pickles, so does Mrs Wages make a ‘mix’ for that too? yes, Mrs. Wages has all different packets of seasonings. Also, I think my kids would LOOOOOOOVE the roll-ups you mentioned. I might have to make them as a treat some time!! Thanks Deb and Andrea! I didn’t even think to query Amazon about this! (And I use Amazon a LOT!) – maybe time of day and being tired. I did order some of the Mrs Wages to try. I cut up bread & butter pickles to put in deviled eggs and in potato salad. They seem to have so much more flavor than just ‘pickle relish’. oh Amazon… they have everything, don’t they! I think what Ruth was trying to say is that even though Nora liked the taste it also perhaps settled her tummy in the process….a lucky coincidence? who knows…..
At our house, my husband and I love pickles of all kinds (including beets & okra) but our boys wouldn’t touch them for years. Our very favorite ones are “Foods of the Smokies” brand bread & butter pickles, “hot and sweet with garlic.” We buy them at the Mountain Farm Museum right outside Cherokee, NC whenever we travel thru. My diabetic friend says her morning glucose level is always lower when she eats pickles after supper the night before. When I had a huge garden I made pickles/sauerkraut in crocks from an old family farm recipe. Super simple, no work and fermented food is excellent for you. We now buy expensive pickles, and hubby likes the ones with hot spices. When jar empty I save the liquid/spices, boil on stove, run bottles thru dishwasher, put cut cucumbers and heated liquid in jars with spices, close refrigerate, u can do that 1 time and u loose no flavor, 2nd batch freebie. Little work. Those look really good and DO look so simple! We’re not huge pickle eaters, but I do love them with burgers and sandwiches. And since you say these last in the fridge, I’m going to try to make them. That is so interesting about your daughter eating pickles when she ate nothing else. Most cultures eat fermented/pickled foods daily. I’m Korean, make my own kimchi and eat it with everything. The kimchi just settles my stomach down, especially after eating heavy foods. I think the good bacteria in the food helps the digestion along.